The EL2809 digital output terminal connects the binary control signals from the automation device on to the actuators at the process level with electrical isolation. The EL2809 is protected against polarity reversal and processes load currents with outputs protected against overload and short-circuit. 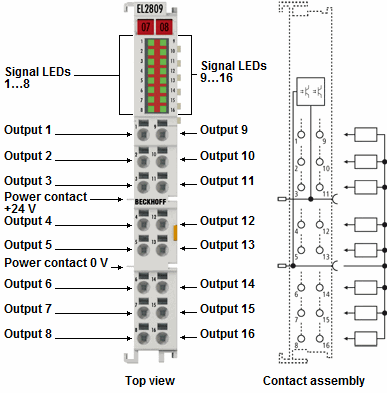 The EtherCAT Terminal contains 16 channels, whose signal states are displayed by LEDs. The terminal is particularly suitable for space-saving use in control cabinets. The connection technology is particularly suitable for single-ended inputs. All components have to use the same reference point as the EL2809. The power contacts are looped through. The outputs are fed via the 24 V power contact in the EL2809. The conductors can be connected without tools in the case of solid wires using a direct plug-in technique. The HD EtherCAT Terminals (High Density) with increased packing density feature 16 connection points in the housing of a 12 mm terminal block.